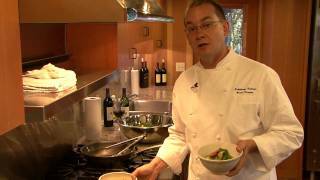 Chef Brian Streeter creates an easy, weeknight meal. Great for the Fall season when the weather gets cool outside. The earthiness of the greens and spiciness of the sausage intensify the berry of our Cakebread Cellars Zinfandel. Remove the central rib from each leaf of kale and tear into bite size pieces. Remove any bruised leaves from the escarole, chop into large pieces and discard the core. Wash in a sink of cold water and spin dry in a salad spinner. Heat a large skillet over high heat, add the olive oil and sausage and toss to brown slightly. Remove the sausage to a small bowl. Add the slivered garlic and the green and toss to wilt, turning often. Add the sausage back to the pan and toss to evenly distribute. Season with salt and pepper. Serve in warm bowls. Allow guests to season greens with a splash of vinegar to their liking.